A selection of treatments to help shape & define the eye area. Enhance your best features in minutes, with a selection of treatments to help shape & define the eye area with Lash Perfect semi-permanent individual eyelash extensions or Salon System products such as Marvel-Lash express and Marvel-Lash instant lash extensions. Lash Perfect is the number one choice for semi-permanent individual eyelash extensions and is the UK’s market leading supplier. 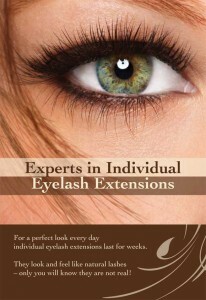 Eyelash extensions are one of the fastest growing beauty treatments both in the UK and internationally. Lash Perfect semi permanent eyelashes enhance your natural lashes by adhering a synthetic individual eyelash to each natural eyelash using the finest medical grade adhesive that is European Union (EU) compliant and comes with an allocated International Organization for Standardisation (ISO) number. Light, comfortable, natural and available in various curls, lengths and thicknesses, Lash Perfect eyelashes are made of the highest quality materials and provides one of the best choice for you. Lash Perfect individual eyelash extensions are semi permanent and can last up to 8-12 weeks, depending on your natural lash growth cycle. To keep your lashes at their very best, we recommend infill maintenance every 2-3 weeks. With expert application by an Osheen beauty therapist and by avoiding the use of oil-based eye products, these eyelash extensions behave just like natural lashes and achieve a thicker, fuller and more flattering look. NO TIME, NEED A QUICK FIX – MARVEL-LASH EXPRESS CREATES LONG, THICK, LUSCIOUS LASHES IN JUST 20 MINUTES. Marvel-Lash EXPRESS promises long luscious upper/lower full on party lashes that last for 7-10 days (up to 2 weeks) – a fantastic treatment for those who want instant full on glamour for that special occasion. Marvel-Lash individual lashes are adhered to your natural lashes creating length and volume with immediate effect. This is the perfect treatment for those short on time, the effects are instant, there’s no need to wear mascara and lashes feel completely natural. CREATES LONGER, FULLER LASHES THAT CAN LAST FOR UP TO 2 MONTHS. A fantastic semi-permanent method of creating longer, fuller, glamorous lashes. Lashes feel comfortable, are virtually weightless and look and feel completely natural. The treatment is simple and safe – Marvel-Lash individual eyelash extensions are adhered to your natural lashes to create the desired effect. Lashes will last for up to 2 months and with regular top up treatments the effect indefinite. At all times when wearing lashes: Avoid getting lashes wet and heat treatments, do not wear mascara or use lash curlers, take care not to touch, pull lashes or rub the eyes particularly when removing other eye make-up. Do not attempt to remove the lashes yourself, return to the salon for professional removal after the time recommended by your beauty therapist.